This happens to me every year and I don’t know why it’s still such a surprise but I cannot believe the holidays are about to be in full swing! Luckily, we aren’t hosting this year for Thanksgiving or Christmas, so I get to focus on doing just a few things and a variation of this crumble is high on the list. 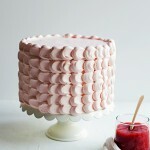 It comes from my friend, Alanna Taylor-Tobin of The Bojon Gourmet’s new book Alternative Baker. I’ve been lucky enough to meet Alanna twice and both times I was struck by her wit and warmth. 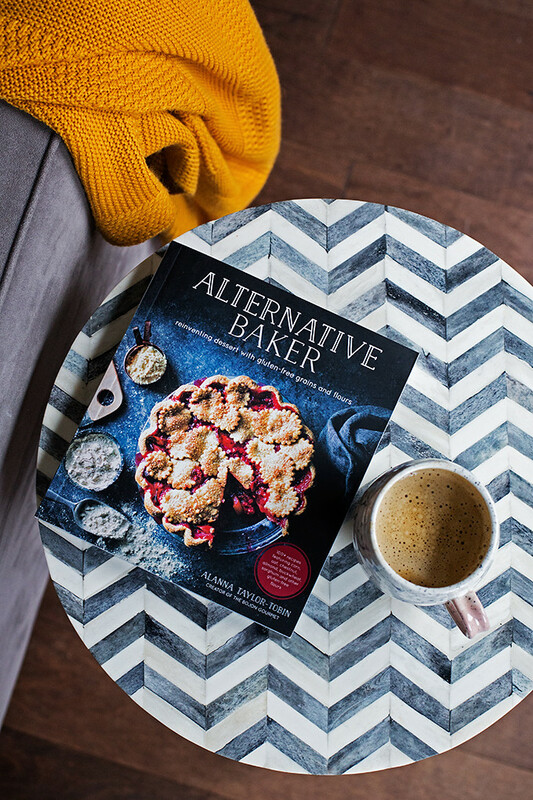 Like her gorgeous blog, her book is full of recipes built upon gluten-free grain and flours that both manage to meet the expectations of their gluten-filled counterparts and celebrate the profiles of alternative flours. One of my favorite features of the book is the short list of flours needed below the title of each recipe. I love handy details like that! 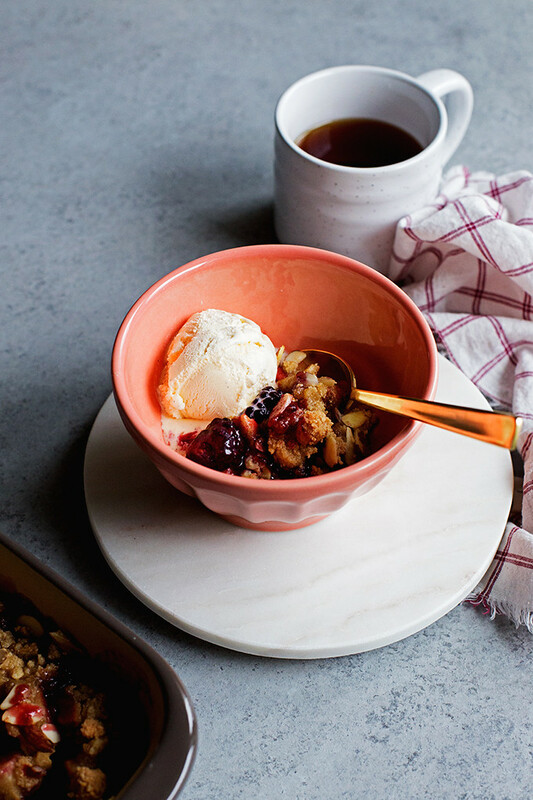 I wanted to adapt Alanna’s Summer Stone Fruit and Marzipan Crumble for the holidays with subtly spiced apples and pops of the marionberries I froze this summer. I texted a fellow marzipan loving friend after I made this, declaring that it might my favorite crumble of all time. Like, for serious. It’s the combination of that bitter almond scent and chewy bits if almond paste combined with sweet baked fruit that just does me in. The best part about this crumble is that you could really adapt this to the fruit available in any given season (fwiw, I think a strawberry-rhubarb variation would be amazing). This almond-scented crumble has chewy bits of almond paste throughout the crisp topping. Position a rack in the center of the oven and preheat to 375°F. 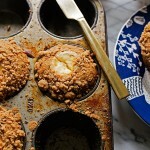 Place an 11x7-inch or 2-quart baking dish on a rimmed baking sheet. 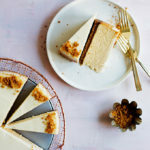 To make the topping combine the almond paste, sweet rice and oat flours, brown sugar and salt in a mixing bowl (or the bowl of a mixer fitted with a paddle, using your hands or a pastry blender, break down the almond paste into pea-sized bits. Add the butter and work it into the topping until the mixture clumps when pinched together and the butter is mostly incorporated. Cover and chill until ready to use. Toss the diced apples, marionberries, cornstarch, brown sugar, and kosher salt together. 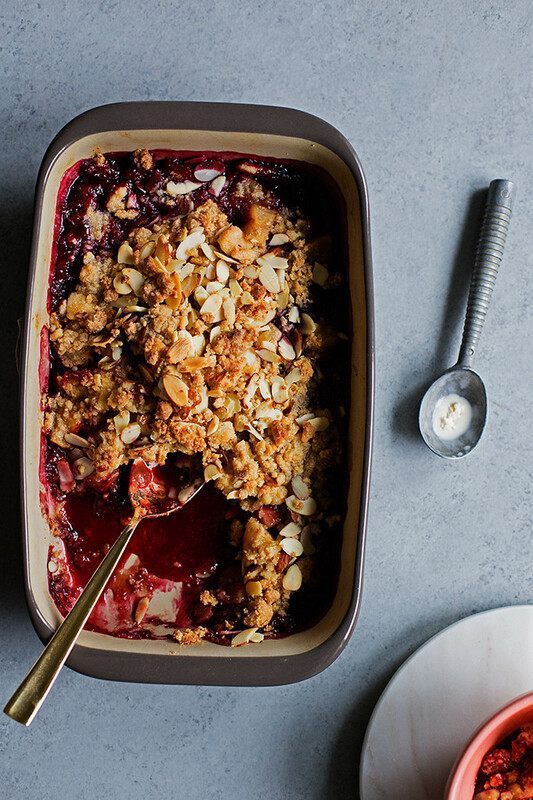 Spread the fruit into the pan and cover with the chilled crumble topping. Bake for 50 minutes, or until the top is golden and the fruit is bubbling. (Alternatively, in her book, Alanna bakes the fruit without the topping for 20 minutes before topping with the chilled crumble and baking for another 30-40 minutes). Let the crumble cool slightly and serve with scoops of vanilla ice cream. 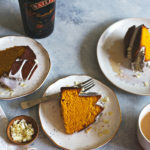 Adapted from Alternative Baker by Alanna Taylor-Tobin. 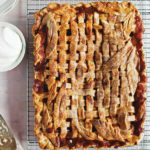 Use a mix of apples if you can for different textures. I used McIntosh, Honeycrisp, and Granny Smith. Fresh berries are amazing when they're in season, but frozen is great too. If you can't find marionberries try blackberries, boysenberries, or raspberries. The roll of almond paste that I purchased was 7 oz, I used the whole thing and it turned out great! 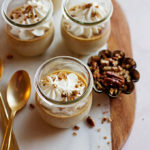 THIS POST CONTAINS AN AFFILIATE LINK, WHICH JUST MEANS THIS BLOG GETS A SMALL COMMISSION IF A PURCHASE IS MADE AFTER USING THE LINK THAT WILL GO TOWARD MAINTAINING HUNGRYGIRLPORVIDA.COM AND MAKING MORE TASTY THINGS FOR OUR EYEBALLS AND BELLIES. that would be delicious with the crumble! Basically, I want to put it on everything. Thank YOU! It’s a lovely book and the crumble is seriously delicious!! Congrats again! OK. I have never used marzipan. I bought two tubes after reading Molly Yeh’s cookbook. I have yet to attempt anything with them. I might do it with this recipe for Friendsgiving. Lovely! If you like almond flavor, you will LOVE it! This is making me hungry, looks delish!